A multicolored aerial sculpture lords over the Rose Kennedy Greenway in Boston in spiderweb fashion, casting rippling shadows over the pedestrian-friendly highway topper. While it appears to be as delicate as lace, the contraption, comprising over 100 miles of knotted fibers, is 15 times stronger than steel and weighs in excess of one ton. 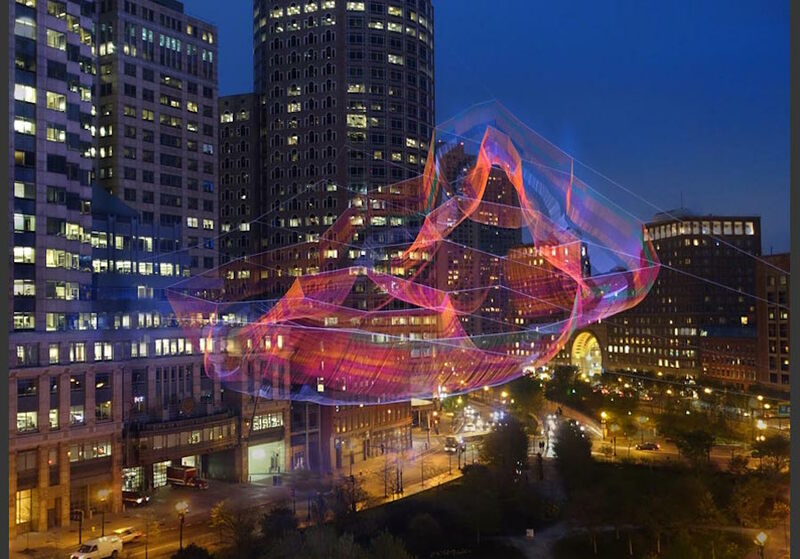 Artist Janet Echelman hand-spliced and knotted the colored rope into half a million nodes, with the entire structure suspended from three adjacent skyscrapers like a hammock 600 feet above the traffic below. Mystically titled As If It Were Already Here, the mid-air spectacle symbolizes the history of its location. 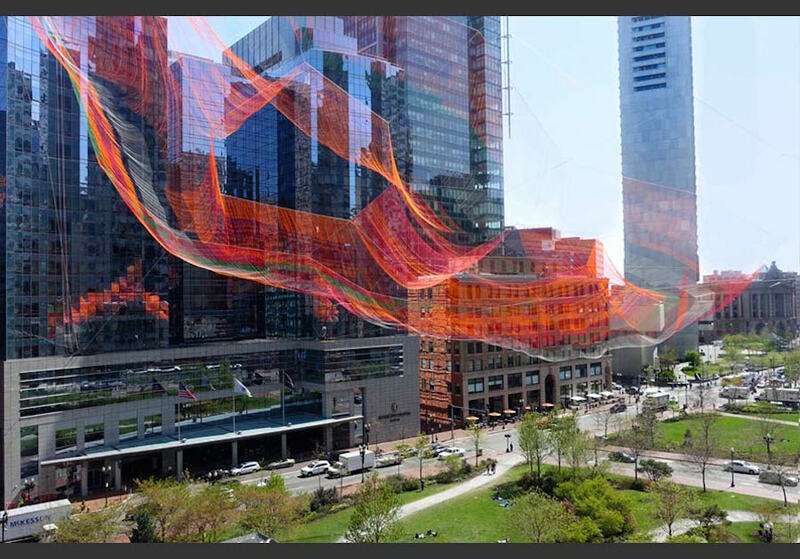 The three voids in the sculpture are a nod to the three hills of Boston, which earned the city its “Tri Mountain” appellation before the mountains were razed in the 18th century to extend the land into the harbor. 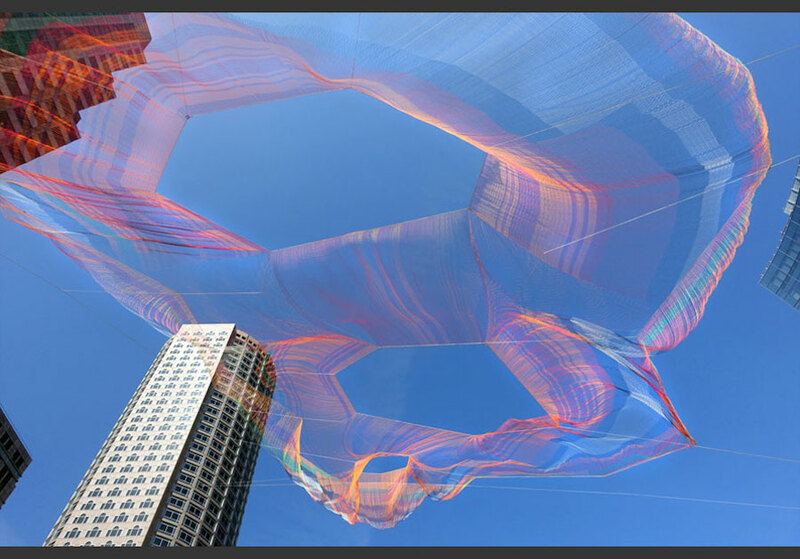 “It is a physical manifestation of interconnectedness and strength through resiliency,” Echelman wrote on her website. 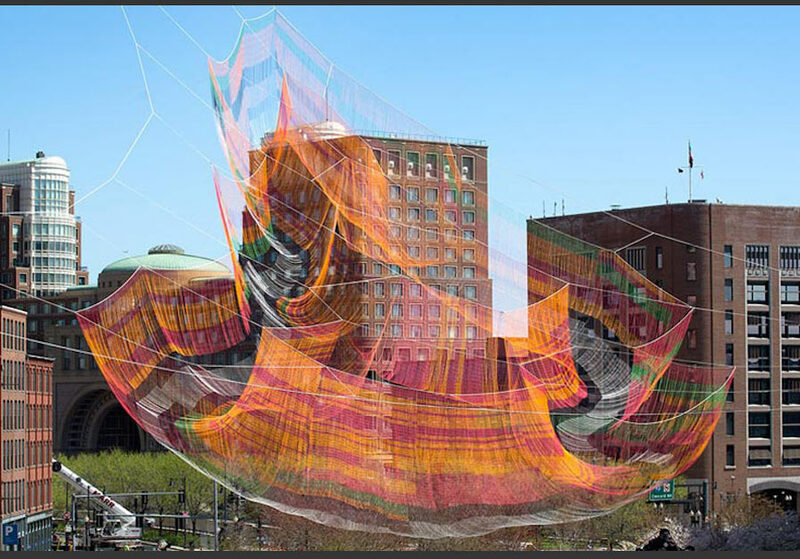 Meanwhile, the bands of color in the netting refer to the former six-lane highway that once dichotomized downtown and the waterfront. 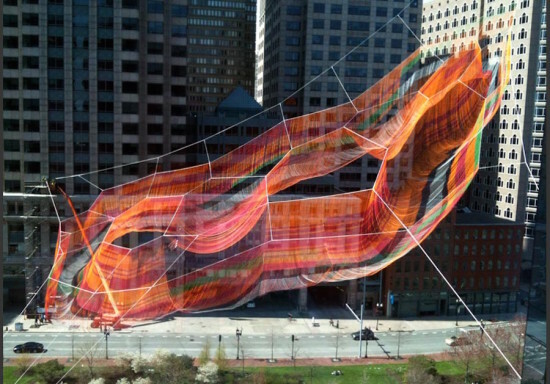 In 2008, it was converted into the Rose Kennedy Greenway. By day, the sculpture blends almost entirely with the sky, so that the striated colors appear as a misty, mirage-like sheen that shifts according to wind speed changes detected by sensors that register fiber movement and tension. This data also determines the color of the light projected onto the sculpture, so that when any one element moves, the entire sculpture is affected. 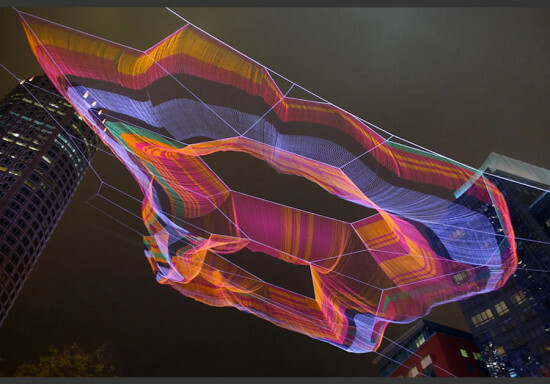 By night, the sculpture illuminates in various colors. The intricate feat of engineering was first modeled on a software program developed in connection with Studio Echelman and Autodesk, featuring a custom plug-in for exploring net densities, shape, and scale while simulating gravity and wind. The sculpture will be on view from May through October 2015 as part of the Greenway Conservancy’s Public Art Program.